Mehul Parekh of Khabar (Right) stands with Bishop Chavers of Alabama Magazine after accepting their Magnolia Awards. Art Director Mehul Parekh, the man behind Khabar’s visual strength, was recognized for his “talent, creativity, and drive over a lifetime in the publishing field,” by a Magnolia Award given by MAGS (The Magazine Association of the Southeast). On December 7, at the third annual Magnolia awards luncheon held at the Mandarin Oriental Hotel in Buckhead, Mehul won in the category of Design over other nominees from Southern Living, Alabama Magazine, and Garden and Gun. 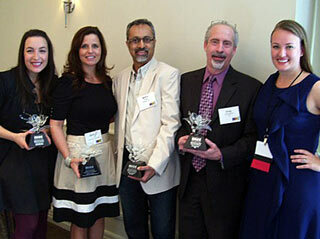 Four other Magnolias were awarded for similar excellence in the categories of Management, Editorial, Online, and Sales. Left to Right; Tova Gelfond of Eidé, Bishop Chavers of Alabama, Mehul Parekh of Khabar, Greg Caccavale accepting on behalf of Banu Yilmaz of Ink Publishing, and Stephanie Davis Smith of MAGS.